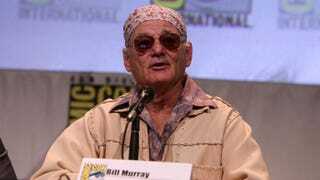 San Diego Comic-Con started with a bang in Hall H Thursday as the man, the myth, the legend Bill Murray entered through the crowd, singing Smoke on the Water, and waxing poetic about life, responsibility and the expectations of this nerd-filled event. Murray, who was in town to promote Rock the Kasbash, had never been to Comic-Con before, let alone inside the massive 6,500 person Hall H. He admitted he was nervous about being among the crazy Star Trek, Star Wars and Doctor Who fans. He then joked about a party he once attended at Skywalker Ranch. “They should have their blood tested, recycled and transfused into other people” he said of their passion.